Women’s Track and Field Assistant Coach Samantha Bluske ran in the 10K at the USA Track and Field Championships June 21 in Des Moines, Iowa. Running under her sponsor “rabbit,” Bluske crossed the line in 33:48.11, taking 13th place. Today was special for Bluske because she was able to be more than just a solo runner. 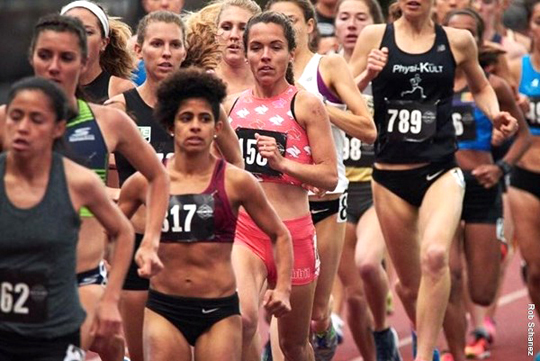 Toledo senior distance-runner Janelle Noe ran in the 1,500-meters June 21 as well, and the two were able to warm up together and offer support ahead of their individual races. “I’m used to going to meets or competitions completely alone with no teammates, so it was pretty cool to experience my first US Championships with her, with this being her first as well,” Bluske said. Bluske said she’s taking a break from competing for a while so she can shift gears and focus on “personal stuff, like trying to survive a wedding.” She’s scheduled to marry her fianceé in a month. This entry was posted on Thursday, June 21st, 2018 at 8:34 pm and is filed under Athletics, Events, News .